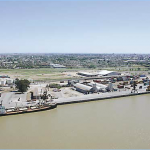 Multipurpose terminal operated by Terminal Puerto Rosario S.A; length 570 m, of reinforced concrete on pilings. 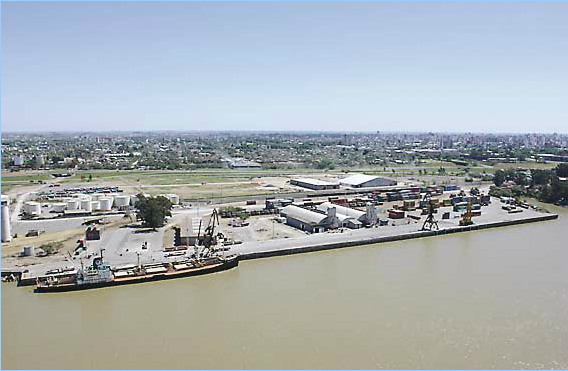 It is a wide, open quay fitted with 1×80 mobile crane plus 2x 40 tone reach stackers for container operations, and 1×25 ton SWL luffing crane equipped with grabs, operates with bulk fertilizers and iron ore (by barges from Corumbá). New bulk cargo area of 23.000 sqm equipped with 6 mobile conveyors, load/discharge rates ranging from 440 tph to 1.200 tph. Two vegoil pipelines from adjacent storage tanks of 93.000 ton capacity are situated adjacent to South end of Wharf. Vegoil load rate about 350/500 TPH. Vessels operate second off if necessary. Depth alongside at datum about 9,75 m (32 ft).